Er, not! Facebook is not just a trend, a glossy new brand that has somehow attracted 325m users. No, it’s a step change in technology. Millions of tiny data items, akin to mini, structured emails, are now flying around Facebook at speed and scale (2bn photos uploaded per month, 2bn links shared per week to be precise). Each has with it (“meta data” to use the technical term) interesting privacy information – we know who wrote what, which friends they want to share it with, when they created it, how they created it. It helps us know more about the relationship between two people, how close they are, what they talk about, what they like doing. That gives Facebook a massive technological advantage when it comes to filtering and providing a valuable start page for exploring the web. If Facebook knows what and who I really like then why go elsewhere, why search for something else for that matter. So, the answer to what comes after Facebook is probably more Facebook. Of course it may not be called Facebook, or even run by them, but under the tin it will be Facebook – tiny chunks of data accompanied by social meta data – filtered and processed to bring you the chunks of data you actually care about. If Facebook is really represents a technical sea change, as I believe it is, then companies ignore integrating Facebook into their long term digital strategy at risk of going dinosaur, a little earlier than they might have expected. Georgia Horsley, the newly crowned Miss England, got caught out today by someone stealing her online identity with a fake Myspace page. Is allowing this to happen the fault of the social networks or is it simply humanity’s common traits showing up again? There have always been two ways to live your life – in the real world of relationships, work and family or in an unreal world of escape to drown your sorrows with drink, gambling or whatever you fancy. Social networks simply mirror the offline world. 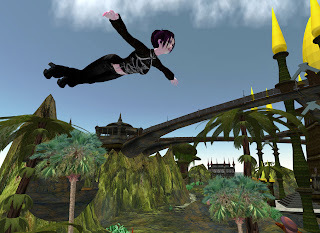 You can choose to “escape” to another world where you take on a different identity – Second Life where you can fly (pictured), Worlds of Warcraft and online poker. Or you can choose to make you real world richer by extending it with more online interactions. Facebook and Friends Reunited do this for your social life, Linked In brings you more business (or at least more job offers). In the end, both will exist side by side – the escape with the reality. Which you choose is up to you. The social networks are just the platforms that allow us to do either. Picture: Copyright 2007, Linden Research, Inc. All Rights Reserved.